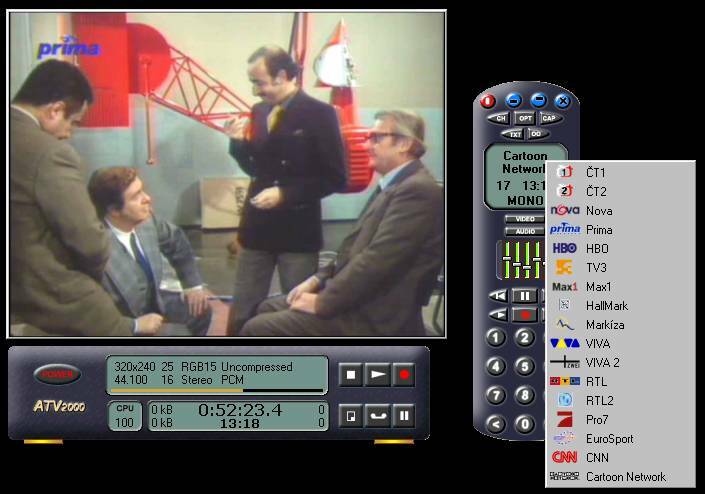 ATV2000 is new generation of TV viewing and capture application based on the old ATV, but with a reworked core. All is build around the new control panel, which provides tuning, video and audio control. Other parts are Video for Window (VfW) and WDM based capture parts with On Screen Display (OSD), but it can coexist with any other capture application like PowerVCR, Windows Media Encoder etc., but giving better TV control. Other advantages are teletext, capture profiles, scheduler, video filters, deinterlace, image capture and more. It works under Windows 95/98/ME and Windows 2000/XP. Windows NT4 is not supported (due to lack of DirectX). Skins - ATV2000 support skins, if you are interested in creating one, it is VERY simple, just go to your paint program (paint shop pro etc.) and make the new image, then create new file name.skn and adjust button and display positions on top of it. it's easy. (please send it to me to publish, thx) Want more skins? Video capture - capture to AVI, can be extended for Ogm, Matroska, MPEG etc., from any capture device including DV devices to any installed compressor, Want more containers? Capture profiles - under WDM you can store preferred capture settings to profiles - includes video size, encoding, compression, audio preferences and compression, AVI settings etc. Video filters - supports DirectShow video filters under WDM, filters included: Special effects (red, green, blue, negative, blur ...), Deinterlace (Weave and Bob with extended processing, more in the future) Want more video filters? Audio filters - supports DirectShow audio filters under WDM, no filters included yet Want more audio filters? 4. In mail describe where is the problem, what causes it etc. Powered by phpBB-nuke. All rights reserved. Page Generation: 0.510 Seconds, 20 SQL queries.